16th-century Burgundian beveled wooden boards covered with black velvet, rebacked, gilt edges with ornamental gauffering, in fitted cloth case gilt, ca. 1503. Purchased on the Acquisitions Fund and the E. Clark Stillman Fund, 1996. Made for Giles of Luxembourg (bishop 1503; d. 10 February 1535) bishop and count of Châlons-sur-Marne, perhaps for his consecration in 1503 (Luxembourg arms on folio 1 surmounted by an episcopal crozier); remained in Châlons-sur-Marne after his death (16th-17th-century names inscribed on front pastedown and on 7 other pages); Convent of Recollect Friars in Châlons-sur-Marne (17th-century ownership inscription on folio 1 and probably late 18th-century stamp on folios 1v, 24, and 39v); 7th Earl of Hopetoun (his armorial bookplate and shelfmark T.12); his sale (London, Sotheby's, 25 February 1889, lot 823) to Ellis; Rev. E.S. Dewick (d. 1917); his sale (London, Sotheby's, 17 October 1918, lot 114) to Ellis; Sotheby's sale, "other properties" (London, 24 November 1921, lot 485); Maggs Catalogue 849, Florence & Tuscany: Music, 1958, no. 351; Christies' sale, "The Property of a Lady" (London, 16 November 1977, lot 317) to Alan Thomas; Sam Fogg, London; purchased from Sam Fogg on the Acquisitions Fund and the E. Clark Stillman Fund in November, 1996. 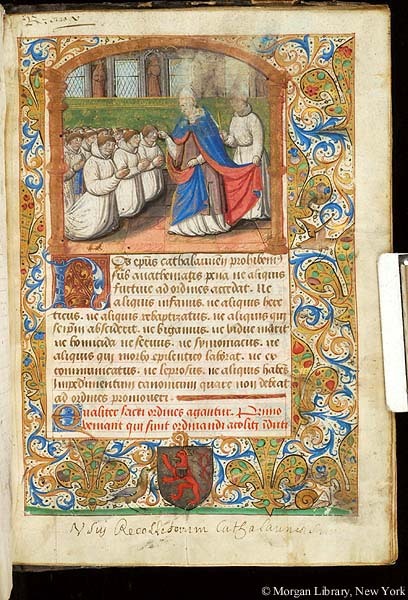 Ms. pontifical, use of Châlons-sur-Marne, written and illuminated in France, Burgundy, Châlons-sur-Marne, ca. 1503. Musical notation: 4-line red staves with black notes. Decoration: 1 full-page miniature, 1 half-page miniature with full inhabited border (arms, birds, and a snail), illuminated initials.